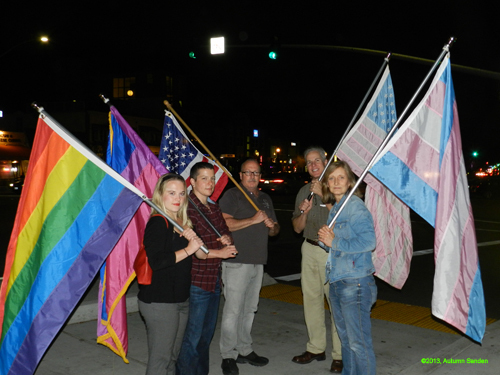 This is imagery of the flags we paraded at the San Diego Transgender Day of Remembrance (TDOR) march. The trans community is also a subcommunity of the LGBT community, and because more than half of trans people don’t identify as heterosexual, in San Diego we include the Rainbow and the Bisexual Pride flags in our march. Assembled, these five flags together send messaging about citizenship and community that I believe is pretty important: I believe imagery and messaging matters. And well, we think about those things here in San Diego. And, of course, we messaged similar sentiments with flags in the Judgment Day For The Pacific Justice Institute. And, it should be noted that there were two military veterans at the Judgment Day For The Pacific Justice Institute action. Trans people shouldn’t have to prove their American citizenship, but often we do. With that thought of trans military veterans in mind, I would gladly hold my 20-year Navy career, as well as my status as a Persian Gulf War, disabled veteran with a 100% VA disability rating (service connected) to Matt Lefever’s, Brad Dacus’s, or Matt McReynolds’ military records – assuming they have any military service records to compare with mine.